Men’s Artistic Gymnastics is a very demanding and challenging sport, requiring high level strength, power, speed, flexibility, endurance, agility, form, technical precision and artistic performance. OGC’s Men’s Competitive Program is for the more dedicated athlete and focuses on the development of gymnastics excellence in an environment where athlete safety, health and wellness are our first priority. In their personal pursuit of excellence, each athlete benefits from ongoing personal and physical development that transfers well to their academic life, social development and performance in other athletic programs. FLOOR is an excellent example of where sport meets art. Each gymnast executes precise strength and balance requirements mixed with technically demanding tumbling elements. POMMEL HORSE is a very difficult apparatus requiring considerable practice to master even the basic skills because the gymnast must perform skills with a circular movement in a horizontal plane while spending much of each routine on only one arm while reaching with the free hand in order to set up for the next skill. Gymnasts do not get to stop or pause during the routine. RINGS require great upper body strength, precision and proper body position while performing strength elements. The rings should be absolutely still and under control at the end of each skill. The body should be straight with no arching, and arms should be sturdy and strong with no shaking. VAULT requires speed and strength down the runway, generating sufficient momentum to produce a high and long post flight off the vault that is essential for completing the various skills. Once in the air, the gymnast then focuses on sticking a perfect landing. PARALLEL BARS routines consist mostly of swing and flight elements requiring hand-eye coordination, timing and balance. Special timing is critical to initiate seemingly effortless swinging elements with technically demanding ‘release’ moves, transitioning into sticking a perfect landing. HIGH BAR routines consist of swings, release moves and high-flying dismounts. Elements include difficult release moves performed high over the bar requiring strength, precision and a lack of fear. 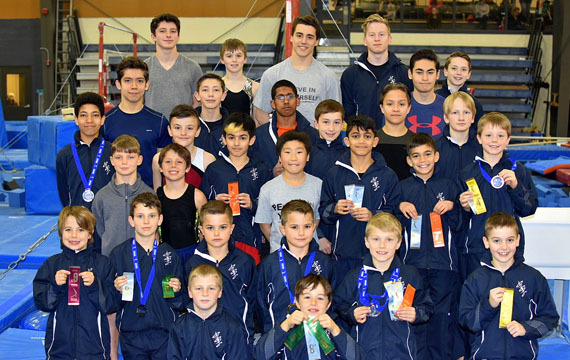 The Oakville Gymnastics Club Boys Competitive Program features one of the most qualified coaching teams in Canada. The program structure includes Pre-Competitive, Provincial and National program streams. Oakville Gymnastics Club has competitive program tryouts each year. Please contact the club for further information. The pre-comp program is for the budding young gymnast who wishes to get involved in a program geared to towards competitive gymnastics. The training schedule is devoted to men’s gymnastics basics, trampoline acrobatic skills and focused physical preparation. The Provincial and National Programs are for the more dedicated athlete, where skill acquisition and routine building are the main focus. Entry into this program is not for everyone and is by audition only. Specific coordination, strength, and dedication are required. The program focus is on development of flexibility, strength, speed, endurance, basic skills and form, as well as advanced skills and routine development for each of the six Olympic apparatus; Floor, Pommel Horse, Rings, Vault, Parallel Bars and High Bar. The High Performance Program is for athletes demonstrating the potential to become one of the top gymnasts in Canada. It is from within this level of competition that National Team members, World and Olympic level athletes develop. The skill requirements, training schedule, conditioning program and the total commitment required of the athletes, parents and coaches is very demanding. This level is for the very talented and self directed athlete only.